THE CHALLENGE: This September 17, Slow Food USA invites us to take back the ‘value meal’ by getting together with family, friends and neighbors for a slow food meal that costs no more than $5 per person. WHY: Because slow food shouldn’t cost more than fast food. 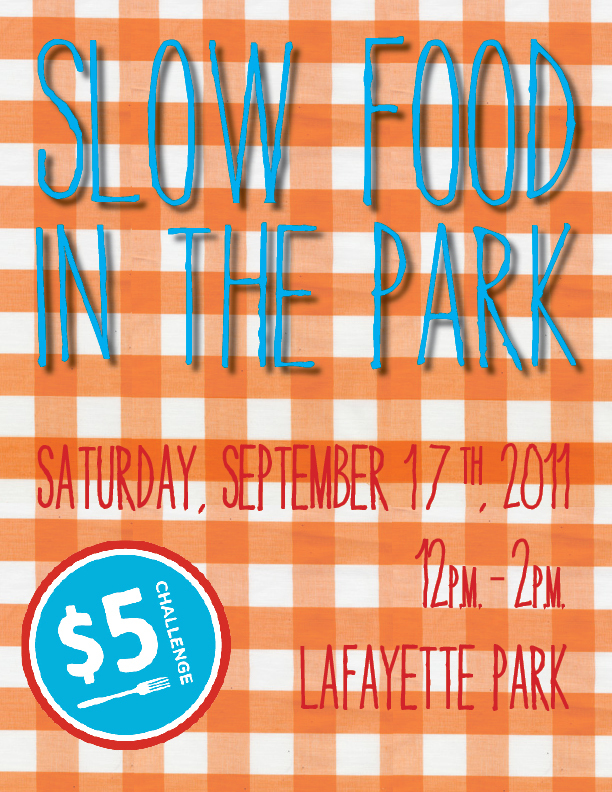 City in a Jar has decided to take the Slow Food idea and RUN! We think that it’s only fitting for us to throw a trip to the Farmer’s Market into the mix. We encourage you to adventure to the farmer’s market that morning to find the ingredients for your dish. 1. You have $5 and $5 alone. 2. You must make ONE dish using only the ingredients purchased with said $5. 3. Including your dish, you must bring the recipe to prove you only used the allotted dollar amount. Allowed items from the pantry: sugar, flour, salt, pepper, olive oil, balsamic vinegar, spices, butter, milk. Let us know if you plan on joining us, here!